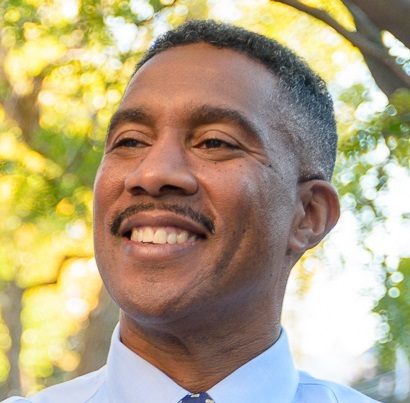 He is set to become Alexandria’s newest city councilor in January, but Willie Bailey does not consider himself a political person by traditional definitions. Bailey will be part of an all-Democratic city council next year, joined by Mayor-elect Allison Silberberg, Vice Mayor-elect Justin Wilson and City Councilors John Chapman, Tim Lovain, Del Pepper and Paul Smedberg, who all were elected November 3 and currently serve on council. Bailey, 51, was born in Richmond and said he spent the first five years of his life living in the rural town of Scottsburg, Va. with his grandmother. Bailey recalled growing up on a farm with no running water and an outhouse. As a way to have fun while helping raise animals on the farm, he said he would jump off the chicken coop or from a tree. That all changed when he moved to Alexandria at the age of 5 to join his parents, having previously only visited the city every couple of months. Bailey said he was so reluctant to return to the country that he would hide under a bed. Bailey lived with his parents, Willie Sr. and Gertrude, and his five brothers and sisters in public housing in Old Town, commonly referred to as The Berg. The family then moved into affordable housing and became homeowners in Del Ray, where Bailey still lives. He went on to graduate from T.C. Williams High School in 1983, and he credits the school and its teachers — and spending time at city recreation centers — for preparing him for the challenges of the real world. Bailey joined the U.S. Army at the age of 21 and spent 21 years in the service, six on active duty and 15 as a reservist when he joined the Fairfax County Fire and Rescue Department. Having served in California, Virginia and Germany, he feels those experiences helped shape him. Since joining the fire department, Bailey has worked his way up from being a firefighter and driver to now serving as a battalion chief responsible for public affairs and community outreach. It is a job that sees him deal with media requests and educate residents of all ages about fire safety. It was through his work with the fire department that Bailey started his nonprofit organization, Firefighters and Friends to the Rescue. Bailey said it began as an effort to raise funds with his fellow firefighters to give out Christmas gifts after he went out on emergency calls and saw families unable to give their children presents. Since then, it has grown into a nonprofit that provides services to the less fortunate in Alexandria and Fairfax County. In August, the organization gave out between 2,000 and 3,000 backpacks with school supplies, in addition to haircuts from local barbers. Last month it gave out more than 2,000 coats and nearly 1,000 pairs of sneakers; it distributed Thanksgiving dinners earlier this week, and the group will give out toys, bikes and gift cards to around 4,000 children this Christmas. Bailey said that all stems from a desire to give back and help those who are in a similar position to him when he was young. It is that desire to give back that drove Bailey to run for city council, now that his two children have graduated from college. He said his main priorities are to preserve affordable housing, ensure Alexandria City Public Schools operate effectively, and make sure that the city’s youth is well served. These issues have special resonance for him, although he is determined to help everyone with a problem from his unique position on city council. “I feel like I have a calling to help people,” Bailey said. “There’s no other reason I ran for city council. People said I was going to be a politician, but I didn’t see it as me being a politician. I wanted to give back to a city that has done so much for me. It has been quite a journey for the 2013 Alexandria Living Legend, a slate of awards to honor residents making a difference in the city, and it is set to be a busy few months as he prepares to ascend the dais. Already, Bailey has met with city staff to learn more about city government, and is preparing for the increased workload ahead as he balances his firefighting responsibilities with the work of City Hall. As he reflects on his journey from child to city councilor, he says it shows that anyone can achieve great things with hard work. “Young Willie Bailey probably didn’t know anything about City Hall — he probably knew more about a chicken coop than he did about a City Hall back then,” Bailey said. “He probably knew more about picking tobacco than he knew about that. Congrats Brother, so proud I had the opportunity to serve with you! !